Listen to music wirelessly with the T3150 Wireless, now with Bluetooth wireless technology. Compatible with most mobile phones and laptops that feature Bluetooth stereo profile, the T3150 Wireless satellites also feature the Creative IFP (Image Focusing Plate) that gives a wide acoustic sweet spot with improved sonic directivity to the listening area. The ideal speaker system for wireless music listening. Listen to music wirelessly with the T3150 Wireless, now with Bluetooth wireless technology. Compatible with most mobile phones and laptops that feature Bluetooth stereo profile, the T3150 Wireless satellites also feature the Creative IFP (Image Focusing Plate) that gives a wide acoustic sweet spot with improved sonic directivity to the listening area. 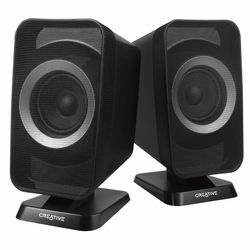 The ideal speaker system for wireless music listening.